When I told my grandmother in 1968 that I was leaving to work in America, she was not thrilled about it and strongly suggested I not go. She was probably concerned that I was going to America, and not returning for a long long time. When I came back on holidays in the spring of 1970, she seemed much less concerned. That surprised me very much. But then she started telling me family stories that I had never heard about before. She told me that all five of her elder brothers had immigrated to the United States in the early 1900’s when she was around twelve years old. Her brothers William Ty Rhos, Twm Tir Dafydd, and John Tyn Ffoes went over to the United States to work, and returned to Wales to live. Hugh and Charles went over, and did not return. Hugh sadly drowned, she said, in the Erie Canal in 1923, and Charles stayed in North America and died in Vancouver, Canada in 1968. This was all startling information to me. I had not heard about this side of my mother’s family before, and it naturally kindled a tremendous amount of interest. My grandmother was born in Bryncroes about fifteen miles southwest of Nefyn along the Lleyn Peninsula in a house called Ty Rhos (Rose House). She was the eighth of nine children born to John and Anne Thomas - five boys and four girls. My grandmother said that when she was a young teenager, she used to play on a hill near Ty Rhos over-looking the Irish Sea, and whenever she saw a ship steaming on the horizon towards Liverpool, she would run home and tell her mother. Sure enough, a few days later her mother would receive a very welcomed letter from one of her five sons in America. All my grandmother’s brothers stayed initially with an uncle named Richard R Williams in Rome, New York. Richard had emigrated from Wales to America in 1891, and worked as a castor in the Rome Brass and Copper Company. He was later employed as a janitor at a local school. The brothers found work through their uncle at the Brass and Copper Company. They stayed in the United States for approximately twenty-five years, worked hard, and saved their money she said. The uncle died in an unfortunate car accident in 1926. Will, Twm and John returned to Wales around 1928. When they returned, Twm purchased a small farm called Tir Dafydd (David’s Land) and John likewise purchased a house called Tyn Ffoes (House in a Ditch) both located in the general Bryncroes area. Will had an accident on a horse earlier in life, and the accident started to affect his mobility. He chose not to buy any property, and decided to live in Ty Rhos with his parents. Charles apparently headed west to California, and to my knowledge little was heard of him until the family was informed of his death at eighty-six years of age in Vancouver, Canada in 1968. But that was not the whole story, by any means. My grandmother recalled her mother Anne Thomas talking about a great aunt of hers named Gaynor, and even a great great aunt of hers named Mary who had both gone over to live in America in a large outflow of Welsh emigrants around 1800 and who never came back. Mary would have been my great, great, great, great, great aunt (great x5 aunt), and Gaynor would have been my great x4 aunt. “You probably have as many relatives over there in America as you have over here”, my grandmother said. This information really intrigued me. Anne Thomas and her son John Tyn Ffoes. I did not return to Wales again until 1976, and by that time my grandmother had passed away. When I pursued the family history issue further, I was always referred to Aunt Jane who lived in a house called Pant-y-Gwril near Bryncroes. Since I had not seen Aunt Jane for several years, on a sunny day in the spring of 1976 my mother and Aunt Nellie took me on a trip down to Bryncroes to visit Aunt Jane. She was such a delightful lady, the spitting image of my grandmother. The welcome in Pant-y-Gwril was unbelievable. Aunt Jane had prepared a magnificent tea for all of us with Welsh scones and all kinds of pastries. She had a wealth of information about the family not only in Wales but also in America, and she eagerly shared that information with me. 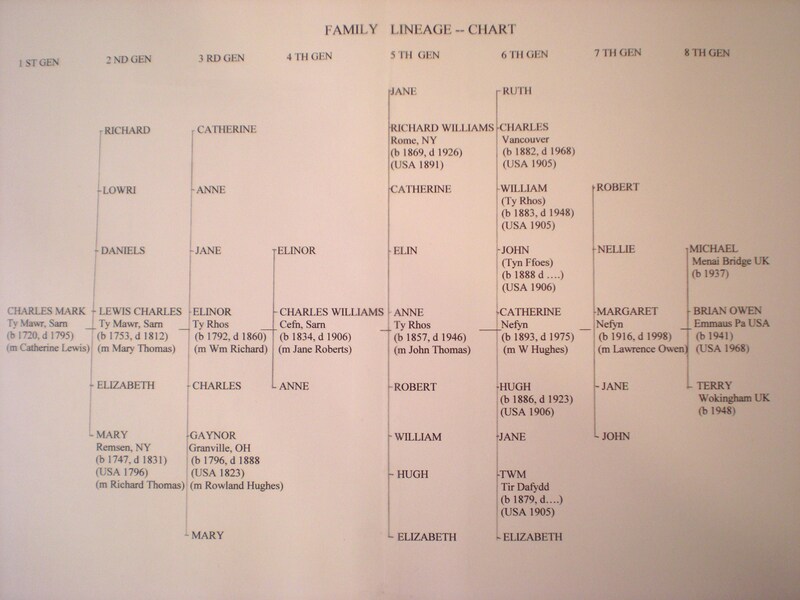 It was from that information that I was able to put together most of the family lineage chart. She took me down to Bryncroes cemetery and showed me the grave of Charles Marc, the first person on the lineage chart, and to Capel Ty Mawr where Aunt Jane was the organist, and from where she indicated half the congregation emigrated in one swoop in the early 1800’s to the United States. She also took me to see the old family home, Ty Rhos, which had since been sold, renovated and modernized. Aunt Jane was not interested in traveling. 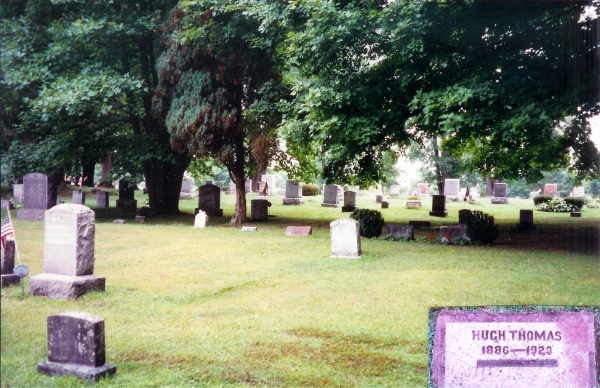 When I asked her what she would like to see or get from America, she said very simply a photo of her uncle Hugh Ty Rhos’s grave in Rome, New York. Hugh Ty Rhos was her favorite uncle, and when she was a child he often played with her. He was always a lot of fun. Also her uncle Will Ty Rhos talked a lot about his younger brother Hugh, and about the challenges they faced as young men going through Ellis Island in New York, and working together in Rome. Will was devastated she said, when they found Hugh’s body in the Erie Canal. Hugh was only thirty-seven years old when he drowned. There was a lot of mystery about his death. She then showed me an old newspaper clipping from the Rome Sentinel newspaper, indicating that police recovered Hugh’s body from the canal, and that both money and a watch were still in his pockets. The article also indicated that Hugh had made plans for a trip back to his native Wales, and that he was looking forward to the trip. His death was never fully resolved. I indicated to Aunt Jane that on occasion I traveled with my work in Bell Labs to the Griffiss Air Force base in Rome, New York. Bell Labs did research/development electronic work for the US military, and contracts for the work was often issued by Griffiss Air Force base. Little did I know at the time I was traveling near Rome, that I probably had relatives in the immediate area, and that some of my ancestors were buried in Rome cemetery just a few miles west of the Air Force base. In 1994 my brother Terry came over on holidays to the States, and we decided to take an exploratory trip to Rome. We first visited the city library, and found the newspaper article on Hugh Ty Rhos that Aunt Jane had shown me together with another newspaper article related to our great, great uncle Richard R Williams’s accident in 1926. The article indicated that Richard Williams lived on Vine Street (located close to the library), and was riding his bicycle to the school where he was the janitor, when the bicycle collided with an auto at the corner of East Dominick Street and Columbus Avenue. There was ice on the road at the time, and the auto skidded into the bicycle and Mr. Williams was thrown twenty-seven feet. He sustained a fractured skull, and died in the ambulance on the way to the hospital. We drove past Richard Williams’s home on Vine Street, followed the path he would have taken to work, stopped for a while at the corner of East Dominick St and Columbus Avenue, and drove past the school where he worked. We also passed the Rome Brass and Copper Company which was still in operation, and where they all worked at one time. We took lots of photographs. Rome cemetery was located quite a distance from the center of Rome. It was a beautifully kept cemetery with large trees on twenty-five acres of land off Jervis Avenue on the northern outskirts of the city. 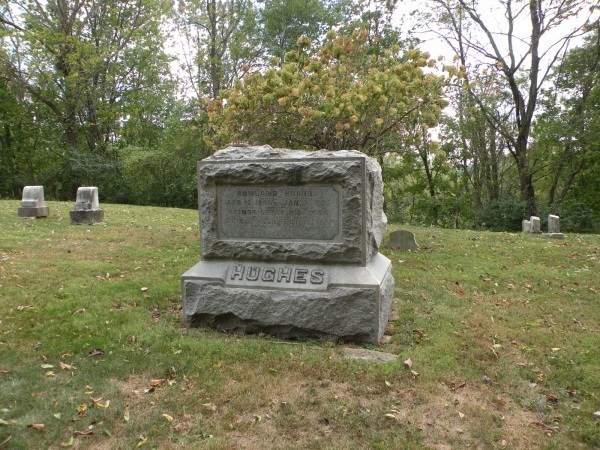 We inquired in a stone building at the cemetery entrance, and gave the name of Hugh Thomas as the gravesite we were seeking. The custodian in the building showed us the records with the burial certificate signed by a William Thomas - Will Ty Rhos. The custodian indicated the burial site was in section m, lot 277. We walked into the huge cemetery and finally located section m. It was in a beautifully landscaped area, and Hugh’s gravesite in lot 277 was nicely shaded under some large trees. We took photographs of the gravesite, and sent copies of all the photos to Aunt Jane. Gravesite of Hugh Thomas in Rome cemetery New York, USA. The gravestone (shown inset) is the small red stonne in the center of the large photo. There is also a memorial plaque for Hugh Thomas in Bryncroes Church. I visited with Aunt Jane in Pant-y-Gwril every time I came back to Wales. She very much appreciated our efforts to get those photos of Rome and Hugh Ty Rhos’s gravesite. She was such a friendly lady and an excellent cook. The welcome in Pant-y-Gwril was always beyond belief. She would cook a Welsh Pwdin Clwt (Pudding in a Cloth) just for the occasion, and she was the only one who could cook it like my grandmother. It was just exceptional. I will never taste a Pwdin Clwt like that again. Aunt Jane sadly passed away in May 2002. Family Lineage Chart from Charles Marc. Before discussing the family chart in detail, let me just clarify a few things related to names in Wales. First, the Welsh had the confusing habit of having their children use their father’s first name as their last name. 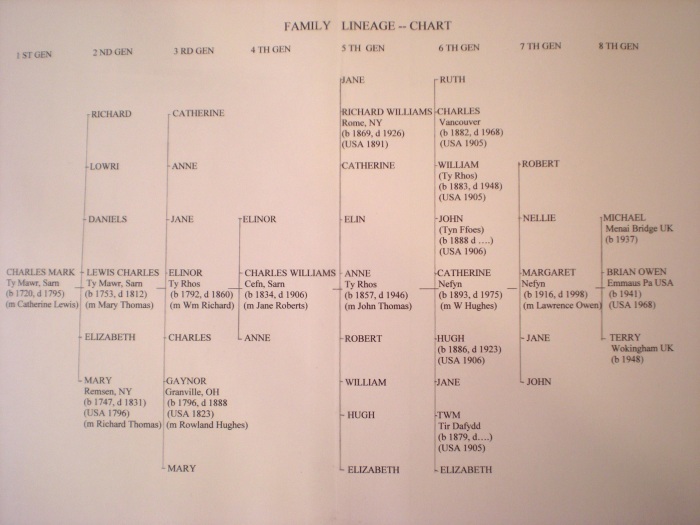 This is evident in the early generations of the family lineage chart, where Lewis Charles took his father’s first name Charles as his last name. The habit was tolerated in Britain, but not in the United States, and there were several instances where people from Wales had to use different last names in America. The habit disappeared around 1850. Secondly, houses in Wales have names, as you may have gathered, and the Welsh people are often locally nicknamed with respect to the house they live in. So Will Ty Rhos refers to a man named Will who lives or has lived in the house called Ty Rhos. Houses in America are not usually named, unless they are of historical significance. The family chart is very restricted in that it goes directly from Charles Marc (1st Gen) to me (8th Gen), and only shows the children of that direct lineage. There are of course a multitude of other lineages and offshoots. Charles Marc was an early revivalist Methodist preacher and a dissenting minister in the days of George Whitfield, the founder of Methodism. Charles lived from 1720 until 1795 on a farm called Ty Mawr, Sarn on the Lleyn Peninsula. He was a preacher at Capel Ty Mawr, Bryncroes and frequently traveled with Whitfield preaching Methodism in Wales. He also wrote a few famous Welsh hymns, which were extensively sung in the chapels. He had many children several of whom died either at birth or at a very young age. Two of his surviving children Richard and Mary (listed under 2nd Gen) immigrated to America in the 1790’s. Very little is known about son Richard, and where he went in the United States. Daughter Mary was married to a stonemason Richard Thomas in Bryncroes in 1766, and the family had several children. In 1796 they decided to leave Wales for Remsen, New York. This was the great x5 Aunt Mary that my grandmother referred to. Getting to Remsen in those days was a very arduous and difficult journey. They crossed the Atlantic to Philadelphia, leaving Wales in a sailing ship probably from Nefyn, Porthdinllaen, or Caernarfon. They decided to remain in Philadelphia until the spring of 1797 before traveling north for approximately two hundred miles, on Indian trails through eastern Pennsylvania and central New York. They were a tough and determined people. They almost certainly passed through Allentown and the Lehigh Valley where I currently live, and then on through early settlements in Scranton, Binghamton, and Syracuse to Remsen. One arrangement within the family was also very peculiar. Only some of the children accompanied their parents to Remsen. The rest stayed behind with their grandparents in Ty Mawr. This was probably due to the hardships of the journey, and the possibility that some children would not survive. A son that stayed in Wales, Ieuan (Evan) Richard, grew up to become a famous Welsh bard called Ieuan Lleyn. Another son that went to America, Thomas Thomas, became famous for a completely different reason. Thomas was an American citizen by virtue of his father entering America in 1796. Acquiring American citizenship was less of a formality in those early days immediately after the War of Independence. In his youth, Thomas led a sea-faring life, and when he was working on a merchant sailing ship traveling from New York to Liverpool, his ship was stopped and boarded by a British man-of-war. Since Thomas was born in Wales, he was forcibly press-ganged into to the British Navy. Britain at the time was in the midst of the Napoleonic Wars, and shortly after, the vessel to which Thomas was transferred, engaged a French frigate. Thomas lost his right leg in the bloody battle, and he was moved to a hospital in Halifax and later London. After recovering, he traveled from London to Wales to recuperate with his Welsh siblings, married Mary Hughes in Bryncroes church, and returned to Steuben, New York where he lived until he was eighty-six years old. He used a peg leg for sixty-five years, and became famous for receiving a disability pension from the British Admiralty for all those years, even though he was an American citizen. 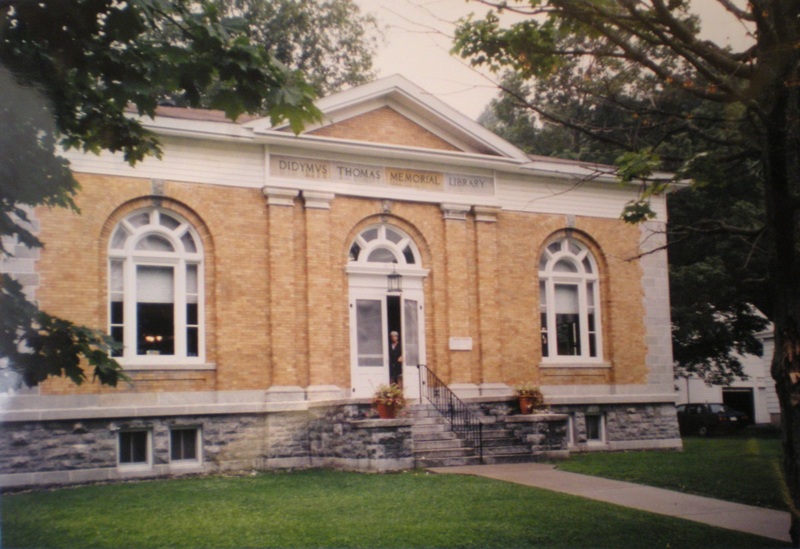 As an addendum to that story, Thomas had a son named Didymus who became very influential in the Remsen area, and after whom the Didymus Thomas Memorial Library in Remsen is named. 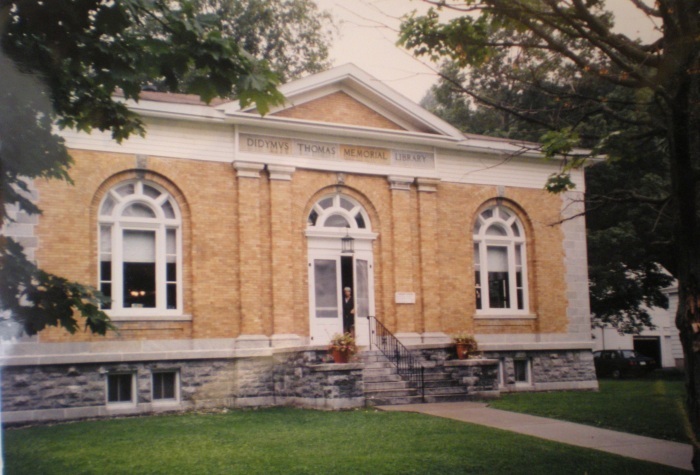 I have visited Remsen on several occasions, and to a Welsh person it is a very interesting and fascinating place. It is located approximately fifteen miles northwest of Rome, New York, and it was the main focus of most of the Welsh immigrants from the Lleyn Peninsula in the early 1800’s. It became also a conduit for many Welsh immigrants into the cities of Utica and Rome in later years. Remsen is located in a very rural area, and although it is not now a wealthy area, its Welsh characteristics are unmistakable. It has a large Capel Cerrig stone meetinghouse in the center of town with a plaque that reads “Adeiliadwyd y Ty hwn gan y Trefnyddion (Whitfield) Calfinaidd Cymreig i Addoli yr Arglwydd yn y flwyddyn 1831” (This House was built by the Welsh Calvinistic Organization to Worship the Lord in the year 1831). It has several Welsh cemeteries even though the early wooden chapels associated with most of those cemeteries have long since disappeared. The cemeteries are named after the chapels, and include Capel Uchaf, Capel Isaf, Pen y Caerau, and Capel Bont. The chapel at Capel Enlli still stands, and it has a small cemetery. To the credit of the larger Remsen community, all the cemeteries are kept in impeccable condition. Richard and Mary Thomas, Thomas Thomas, and Didymus Thomas are all buried in the Capel Uchaf cemetry in Remsen. Another interesting branch of the American side of the family was great x4 Aunt Gaynor that my grandmother referred to. She is listed on the chart under 3rd Gen. Gaynor was a grand daughter of Charles Marc, and she married Rowland Hughes in 1821 in Bryncroes. They had one daughter Mary, and the family immigrated in 1823 to Trenton, New York near the home of her Aunt Mary and her American cousins in Remsen. Rowland and Gaynor Hughes lived in Trenton for a few years, had another daughter Jane, before migrating west to another Welsh community just being formed in Granville, Ohio. Ohio at the time was on the exploratory western edge of the United States. It was established as a state in 1803, but there were significant Indian uprisings in the area during the War of 1812. Those uprisings did not completely abate until the early 1820’s, and Ohio was still regarded as virgin pioneer territory. The family probably traveled overland in a wagon with their belongings for two hundred miles from Remsen to Buffalo, followed by a boat trip on Lake Erie from Buffalo to Cleveland, and then an overland trip south for another one hundred miles from Cleveland to Granville. They purchased land on the south side of Granville, and farmed the land until they died. They had a total of nine children with five surviving. They celebrated their golden anniversary in 1871 surrounded by a large family of children and grandchildren. They were regarded as early pioneers of Granville. 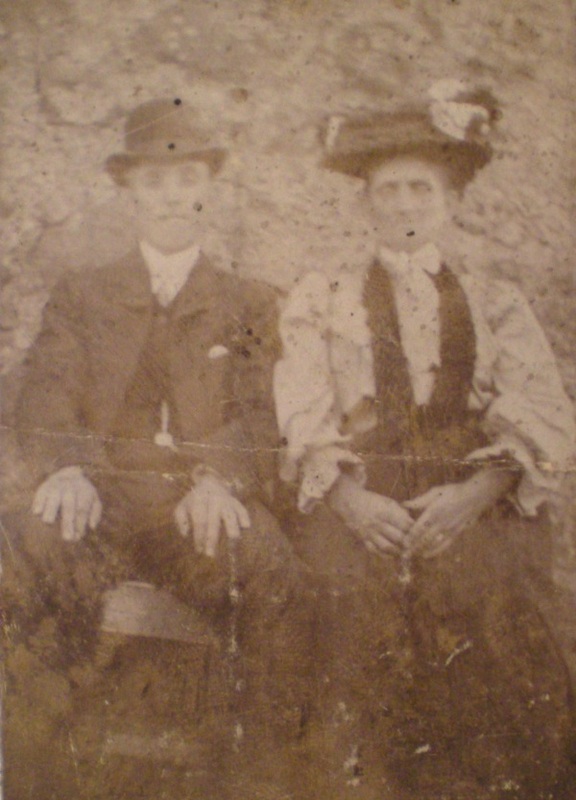 Rowland Hughes died in 1885 at the age of eighty-four, and Gaynor Hughes (Gaynor Lewis) died in 1888 at the age of ninety-two. They are buried in the Maple Grove cemetery in Granville. Gravestone of Rowland Hughes and his wife Gaynor Lewis in Maple Grove Cemetery, Granville, Ohio, USA. They were married at the Church in Bryncroes. Granville is located five miles north of interstate 70 approximately thirty miles east of Columbus, Ohio. It is a charming little college town where Denison University is located. The town has a rich history, and it started in 1803 when a significant group of Welsh pioneers settled in an area just northeast of the town. It is a fascinating place for any Welsh visitor. We have visited Granville on several occasions. The town has many historic homes with Welsh names including Ty Fy Mam (My Mother’s House), Cilgwyn Bach (Little White Retreat), Ty Mawr (Large House), Bryn Du Mansion (Black Hill Mansion), Ein Cartref (Our Home), Pen y Coed (Head of the Woods House), and Tan y Bryn (Below the Hill House). The Granville Inn, although not a historic home, is also a very impressive stone building with a strong Welsh connection. The Inn was built in 1925 with sandstone quarried from the nearby Bryn Du estate. Its owner was a wealthy local citizen named John Jones. He brought four young stonemasons over from Wales to Ohio to do the work, and they meticulously dressed each and every stone during the Inn’s construction. This is a just a brief look at a few stories of Charles Marc’s family descendants in Wales and in the United States. It has been interesting to visit the places in America where some of those descendants lived, and raised their families after leaving Wales. Seven generations later, the number of Charles Marc’s present-day descendants on both sides of the Atlantic must total several thousand people. I am sure there are many, many other interesting stories.